A new imaging capability that provides direct probing of the solid electrode-liquid electrolyte interface enables, for the first time, a way to investigate the surface and diffused layer with chemical speciation in liquids in situ using time-of-flight secondary ion mass spectrometry (ToF-SIMS), a surface-sensitive imaging technique. This cartoon depicts the new microfluidic E probe, developed at Pacific Northwest National Laboratory, in position on a ToF-SIMS instrument. Enlarge Image. Results: A new imaging capability that provides direct probing of the solid electrode-liquid electrolyte interface enables, for the first time, a way to investigate the surface region and diffused layer region with chemical speciation in liquids in situ using surface-sensitive techniques. Developed by scientists at Pacific Northwest National Laboratory, the electrochemical probe, or E probe, combines microfluidic, chemical physics, electrochemistry, and sensitive surface techniques. Using this probe, the scientists showed the molecular composition of the reaction products and intermediate species at different stages of the redox cycle in situ using-for the first time-time-of-flight secondary ion mass spectrometry (ToF-SIMS), a surface imaging technique that operates in a vacuum. "The E probe offers a solution to a previously unsolvable problem-gaining physical evidence of the interface," said PNNL chemist Dr. Xiao-Ying Yu, who designed the device. 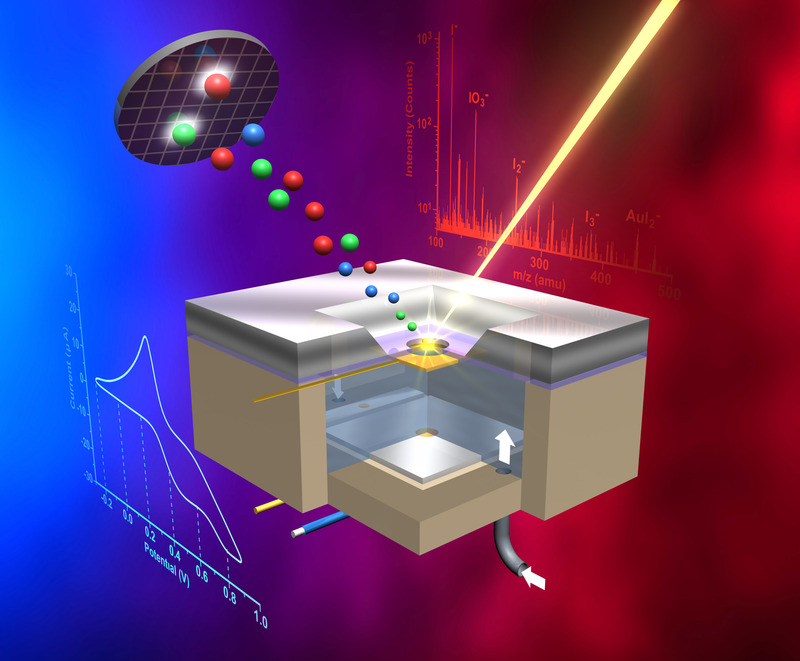 "It allows us to do real-time imaging at the solid-liquid interface at a fundamental level." The research appears as a Technical Innovation article in The Royal Society of Chemistry journal Lab on a Chip and is featured on the March 7, 2014 back cover. Why It Matters: The solid-liquid interface is the most common interface in electrochemical systems. It impacts areas as diverse as prolonging the life of lithium-ion batteries, designing catalytic reactions that can convert biomass to biofuels, and extracellular electron transfer in microbial communities where bacteria catalyze electrode surfaces and shuttle electrons externally, as in a microbial fuel cell. The surface atoms exhibit high chemical reactivity because of the different chemical environment compared to that in the bulk of the system. The solid electrode-liquid electrolyte interface presents a grand challenge for direct observations to gain understanding of charge transport, phase transitions, and growth of solid interfaces. While the invention of surface science techniques has made investigation of adsorbed molecules possible, molecular-scale surface science studies are conducted primarily at solid-gas and solid-vacuum interfaces, not at the solid-liquid interface, because applying vacuum surface-sensitive techniques with liquids that have high volatility is challenging. As a result, detailed studies using these techniques for in situ observations are lacking. "This is a tremendous innovation for in situ studies as a new means to interrogate the chemical language of microbial system interactions, as well as being relative to the discovery and development of new electrode materials for energy storage," said Dr. Louis Terminello, who leads chemical imaging work at PNNL. "Moreover, this capability could be transformative for the study of chemical fluxes and effectiveness in advanced catalytic systems." Methods: The researchers used a classical electrochemical system containing gold and platinum electrodes in a dilute potassium iodide electrolyte to demonstrate the feasibility of the E probe, because that system has been studied extensively by various techniques, and the chemistry is well understood. They coupled cyclic voltammetry (CV), an electrochemistry approach, and ToF-SIMS and used them simultaneously. This approach enabled the scientists to observe, for the first time, kinetics at the electrode-electrolyte interface in real-time. Yu began working on the device 2 years ago with Dr. Li Yang, a former PNNL postdoctoral scientist. PNNL postdoctoral scientist Dr. Bingwen Liu constructed the E probe. Dr. Zihua Zhu, an instrument expert, led the ToF-SIMS operations. The other two coauthors, Xin Hua and Zhaoying Wang, were visiting students who participated in the experiments. The base version of the device made vacuum surface analytical technique studies possible by providing a microfluidic interface that exposes the liquid directly to an analytical probe such as scanning electron microscopy or ToF-SIMS. The E probe provides a new pathway to observe the interface and understand what happens on the solid electrode surface and the adjacent electrolyte as charge transfer occurs. "This is an important milestone," emphasized Yu. "We made a unique, cool gadget, and now we can see the dynamics at the interface." What's Next: The researchers want to use the E probe to study electrocatalysis in biofuels and biological systems as electrode materials. Meanwhile, a U.S. patent has been granted on the device and another patent is pending on its associated applications. This capability is available at EMSL, a Department of Energy national user facility. PNNL is also working with an industrial company interested in manufacturing and selling the device. Sponsors: The work was supported by the Chemical Imaging Initiative, funded by PNNL's Laboratory Directed Research and Development program, Use at Facility Funds at PNNL, and U.S. Department of Energy (DOE) Chemical Sciences, Geosciences, and Biosciences Division. Research Team: Bingwen Liu, Xiao-Ying Yu, Zihua Zhu, Xin Hua, Li Yang, and Zhaoying Wang, PNNL. User Facility: EMSL, Environmental Molecular Sciences Laboratory.